The underwear brand INMAN underwear announced on June 13th that they raised tens of millions of yuan in Series Pre-A financing, invested by Plum Ventures. The angel round was invested by the team of INMAN. INMAN underwear was incubated last year by INMAN, the Cotton and Hemp lifestyle brand. Featuring wireless, comfort and quality materials, INMAN underwear has over 1000 SKUs, and covers multiple categories including underwear, home wear, thermal wear and so on, with a price range from 150 to 200 yuan. In August this year, INMAN underwear will launch a smart underwear product, Mimibook. The product will provide rotate-magnetic chest massage. With temperature sensors, the product can predict menstrual cycle, collect chest health data through algorithm technology and transmit to the APP-end. Currently, INMAN distributes mainly through traditional e-commerce platforms, TMall and JD with a monthly turnover of 5 million yuan. 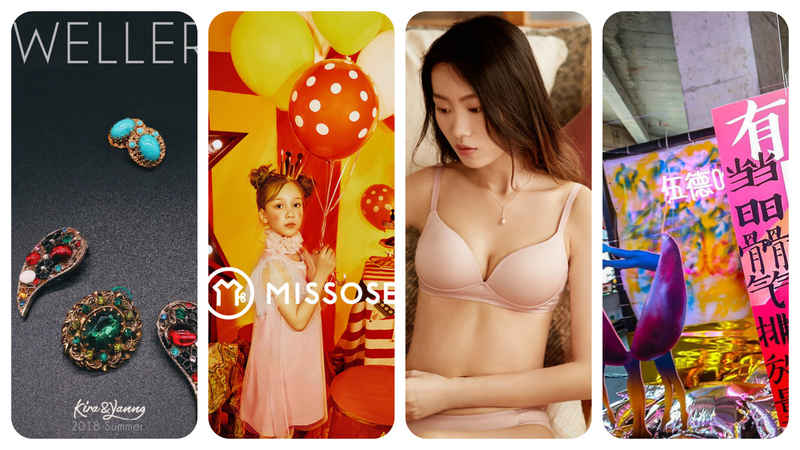 The high-end kidswear brand MISSOSE announced on June 14th that they raised millions of yuan in angel financing. The investors were not disclosed. The financing will be mainly used to expand production and sales channels, and to create new brands. Missose was established in January 2017, targeting middle-to-high-end family customers. Currently there are two product lines. One is conceptual kidswear with imported materials, priced from 2000 to 5000 yuan with customized services. The other is daily collection with prices under one thousand yuan. In the marketing side, MISSOSE attended the kidswear fashion weeks in New York and Beijing. Also, MISSOSE collaborated with the famous IP “Alice in Wonderland” and designed a joint collection of dresses, and invited a number of child starts to shoot fashion magazines or attend TV programs. The new retro females lifestyle brand Kira & Yanng announced on June 15th that they raised millions of yuan in angel financing, invested by Sinovation Ventures and Newsion Venture Capital. Kira & Yanng was established at the end of 2017, focusing on the light retro womenswear from 1920s to 1980s. Kira & Yanng applies the classic elements from vintage clothing to modern fashion design. Currently Kira & Yanng has 8 styles with a price range from 500 to 1500 yuan. In addition to womenswear, the brand also provides nearly 50 styles of accessories, curated by buyers. The coffee brand LUCKIN COFFEE announced on June 12th that they raised around 200 – 300 million US dollars in Series A financing. Its valuation exceeded 1 billion US dollars after the investment. LUCKIN COFFEE started the trial operation since early this year. With the operation model of self-serve retail store and takeaway, LUCKIN COFFEE sells coffee through APP orders, takeaway and self-pickups. Made with Swiss-imported coffee machines and Arabica coffee beans, LUCKIN COFFEE provides American coffee, latte, Australian white and other products. As of the end of April, LUCKIN COFFEE has opened over 500 stores in 13 cities including Beijing, Shanghai and Shenzhen. The sports industry platform HEALTH MALL announced on June 10th that they raised 500 million yuan in Series C financing. The investors were not disclosed. The financing will be mainly used to promote its main business. HEALTH MALL was established in 2015. By entering the sports industry through private fitness coach reservation services, HEALTH MALL has extended the business to venue development, tournament sponsorship and hosting, community sports sharing facilities and so on. Currently the platform has three main business sectors, providing SaaS management tools to sports talents, e-commerce platform to C-end users, and sports related IP incubation. The overall turnover was nearly 1 billion yuan in 2017. Focusing on the North America area, the customized travel platform KUAIBANGXING announced on June 14th that they raised millions of US dollars in angel financing. The investment was led by Daosheng Capital. The financing will be mainly used to discover tourism resources in North America, to upgrade service systems and to build self-owned channels and content platforms. KUAIBANGXING was established in February 2016, providing one-stop long-period tour services in North America. Users can choose existing routes or customize routes according to their needs. In addition to tour planning, KUAIBANGXING also provides chartered coach, airport transfer, hotel and ticket services in Chinese language. The artwork e-commerce platform YISHUVIP announced on June 12th that they raised tens of millions of yuan in Series Pre-A financing, invested by Luojia Fund. Previously YISHUVIP raised 10 million yuan in angel financing in May 2017. Featuring a B2C model, YISHUVIP built their own warehouse in Beijing. After agreed with artists, their artworks will be stores in the warehouse. In order to provide convenient services to customers, the platform collects the data of artists and their artworks, and launched art ranking board according to regions, years and other factors. At present, the platform has signed agreement with more than 2000 artists and had over 400,000 registered users. The unit customer price is around 3000 yuan and the monthly turnover is around 300,000 yuan. Its warehouse has more 800 pieces of artworks, with a total value of 15-20 million yuan. The compounded scenario consumption experience service provider WOOKSTOCK OF EATING announced on June 10th that they raised tens of millions of yuan in Pre-A financing. The investment was led by Meridian Capital and followed by Zhonglin Capital and its previous investor Matrix Partners. The financing will be used to expand event operators and to replicate the models. WOODSTOCK OF EATING was established in 2015. Featuring the “food market” at the early stage, WOODSTOCK OF EATING has extended gradually to music, workshops, fairs and other forms. They have launched three service modules, “Wu Tai”, the urban integrated physical space, “Beautiful Music”, the music factory brand, and the “Border-less” market. The wrist-watch trading service platform YOU WATCH announced on June 11th that they raised Series A financing, invested by KIP, the Korean investment partner. The detailed amount was not disclosed. YOU WATCH was established in 2015, covering five business modules, supplier solutions, watch leasing system, watch recycling system, watch sales system and watch service system. YOU WATCH integrates all these modules in its self-developed SaaS system and provides to wrist watch merchants by installing touch-screen interactive devices. Currently, the first-generation system has been installed in over 100 merchants in 12 cities.